Product prices and availability are accurate as of 2019-04-22 03:47:14 UTC and are subject to change. Any price and availability information displayed on http://www.amazon.com/ at the time of purchase will apply to the purchase of this product. 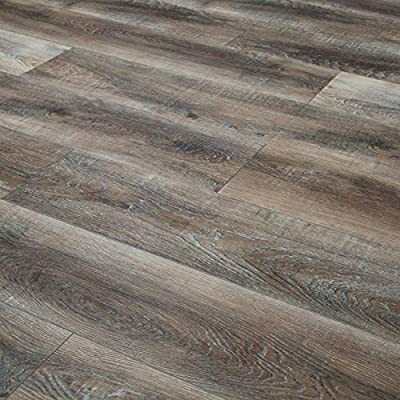 SKID SPECIFICATION: 35 boxes per skid 840.70 sq.ft per skid 24.02 sq.ft per box BestLaminate Sound & Heavy Sherwood Weathered Oak will bring a rustic and reclaimed wood look to your home! This floor has a beautiful synchronized texture that mimics natural wood grain and knot. Sherwood Weathered Oak offers a stylish variation of tones and shades that will compliment you home! Installation is DIY friendly with a I4F Drop Lock system where the planks will click together at ease. This floor is 100% waterproof as well as stain and scratch resistant with a 20 mil wear layer.